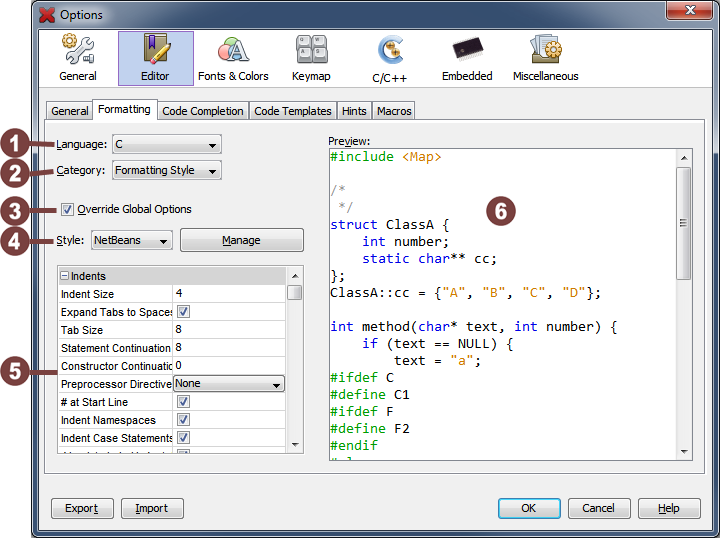 The Formatting tab in the Editor category controls the editor's automatic code formatting feature. 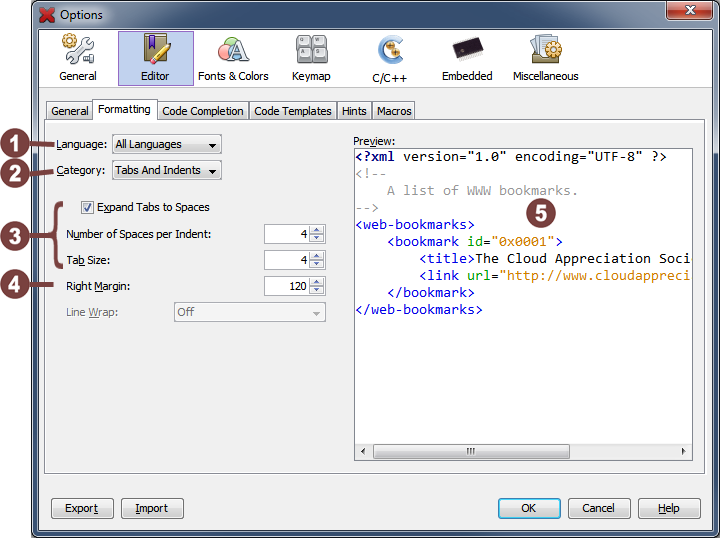 Formatting rules such as the placement of braces, line alignment and spacing can all be specified here. These settings will determine how code is formatted when using features like code templates and the Format command under the Source menu. These settings for All Languages are overridden by default in the language specific settings. Changing these values will have no effect unless you uncheck Override Global Options in the language specific settings (C, C++ and C/C++ Header). 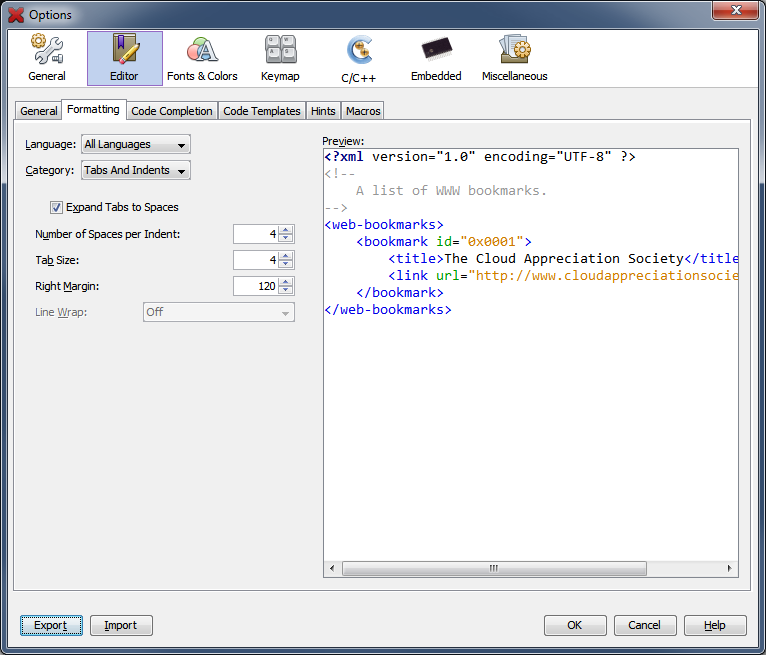 This property determines where the vertical red line is displayed in the editor, indicating what should be the maximum length of a line, specified as the number of characters. This is useful if you want to ensure your code can be printed in the width of a single page or if you are concerned about lines running too long, requiring scrolling to the right to view their ends. The setting is only a visual cue, and does not enforce the right margin, so you can continue typing lines as long as you wish. If you want to eliminate the red line altogether, set the right margin to 0. The example box provides live, visual feedback as you change properties on the left side of the window. Sample code is displayed that reflects the settings you specified. When set to C, C++, or C/C++ Header you will be presented with an identical set of properties as shown below. Each set of properties are independent of one another, making it possible for C to have completely different settings from C++. The Category box acts as a filter for the Properties grid below. Each section in the Properties grid has a grey heading that corresponds to one of the categories in this list. Allow properties for this language's settings to override properties in the All Languages settings. This drop down box lets you choose from a list of style presets for the selected languge. Clicking on the Manage button will let you add, modify, delete, or create your own custom style preset. In this section you are presented with a list of all the formatting choices that programmers love to argue with each other about. These properties will be appied to a selected file whenever you select from the main menu Source ► Format. They will also be applied to individual blocks of code added in via the Code Templates mechanism.